For the last decade, my career has had two main focuses: making faculty members’ lives easier and improving student outcomes through the appropriate use of educational technology. Let’s think about both of these tasks. Making faculty lives easier means not taking up too much of their time. However, improving student learning outcomes isn’t something that magically happens without hard work (and lots of time) from faculty. The very use of educational technology is intended to improve processes and streamline the flow of information, but we have to remember that this has to be valuable information. The act of using new technology just to use technology tends to add little value to the student learning experience and therefore should be avoided. For this information to be valuable in the student learning process, it must have a direct correlation to improving their learning. When we break it down, information is delivered to students via two main avenues: content delivery and assessments. Content is obviously the main driver of our courses…but we can’t forget about the role our assessments play in advancing student learning. Of course, there is the benefit of using assessments to confirm students are appropriately learning and retaining content. However, the primary use of assessments as delivering content is through assessment feedback. This has traditionally been the mechanism through which students learn via their assessments. There’s a lost opportunity in this method, though. A more efficient process to consider would be to deliver content within an assessment and then also provide the performance feedback students need to be successful. Consider how synchronous and asynchronous content is currently delivered in our courses. Regardless of whether our students are live in class with us or learning on their own time, we tend to introduce content to them in a slide-based format. Fortunately, ExamSoft delivers materials through its testing software to students in a very similar slide-based manner. Faculty can even control if they want students to navigate through each question item/slide in sequential order or if they want to allow students to be able to access previous items. When we view each question in an assessment as a slide, it opens several new options for content delivery with our assessments. When you create an essay question, you essentially have a blank canvas for content delivery. Want to include a case-based scenario in the text? Copy and paste it right in there. Need to supplement your content with a table, chart, video, and/or image? Drop it in the text or simply add it as an attachment. Now, these essay items are serving as more than just an exam question; they’re delivering content to be absorbed by students as well. Using an assessment tool as a content delivery tool doesn’t limit use of the program to essay items alone. Throughout the assessment/module, all question types can be added to engage students while assessing them on concepts along the way. 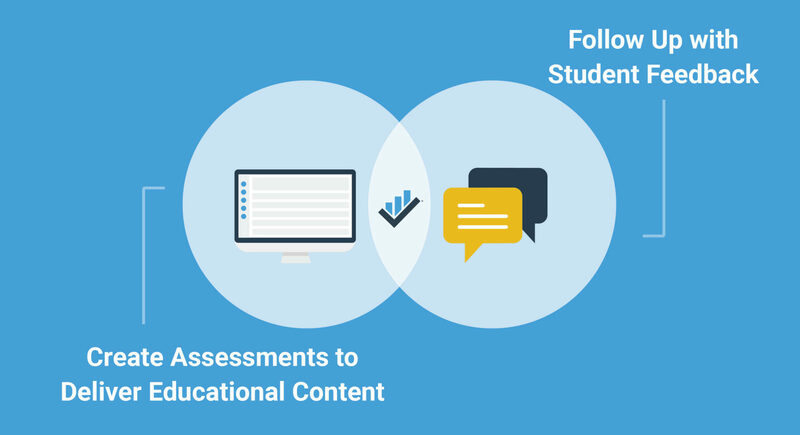 Therefore, content can be delivered and students can be assessed at different levels through items that match best with the content being assessed. I prefer to give students case-based content in the first question and have them use the answer space to jot down their notes on the case. I then follow with two to five multiple-choice and/or Hot Spot questions to ensure students understand the basic concepts in the content before having to apply this knowledge at a higher level on upcoming fill-in-the-blank and essay questions. Furthermore, using multiple-choice items is an opportunity for faculty to communicate which concepts are most important to students. This will better prepare students for the remaining content and assessment items in the module. Just because you’re delivering content through an assessment doesn’t mean you can’t score students’ performance. However, if you don’t want an item to count for points, it can be weighted as zero points, and then students can be encouraged to type any notes they may have in the answer box. Any text typed into the answer box can be reviewed by faculty later and also shared with students immediately after the assessment. This method is especially valuable when working with students who need remediation. Understanding students’ thought process as they work through a case by reviewing their notes with them empowers faculty to be more strategic in their teaching. This all brings us to providing students feedback—the key piece that is needed to truly make sure your formative assessments are helping to improve student learning. Fortunately, as you build your assessment, the feedback can be included to be distributed whenever you choose post-assessment. Additionally, post-assessment feedback is completely customizable to include whatever information you would like students to review. This means that after every module, students can receive a detailed, customized report on their performance, including the content and any notes they may have taken during the module at the time of your choosing. On top of all of this, the ability to tag all of these content and assessment items to learning outcomes and course/programmatic objectives creates the opportunity to provide students the information they need to be successful while simultaneously helping to map your course. Traditionally, curricular mapping for accreditation has been limited to mapping assessments. Delivering this synchronous or asynchronous scenario-based content within an assessment tool provides the opportunity to map content as well. Providing students ample opportunities to absorb and digest course content within a given amount of time is key to learning. Assessment of that content is vital to understanding if that learning is turning to long-term retention needed for ongoing student success. Using a testing software to deliver content, assess students, provide students quality feedback on their performance, and map your curriculum—this is the very definition of using educational technology in an effective and impactful way. By using faculty time efficiently while creating robust teaching and assessment opportunities to improve student outcomes, everyone wins. It doesn’t get much better than that. Learn more about using a testing software to deliver instructional content through this on-demand webinar.